Good lighting is essential when you do a lot of close up work. 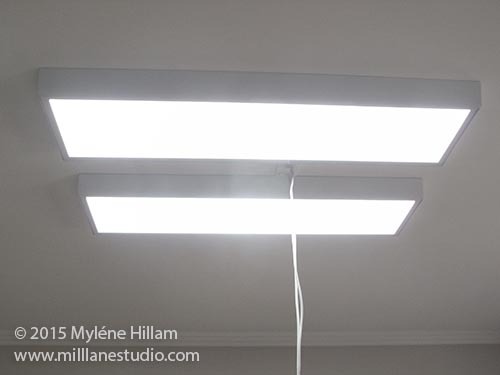 When I moved in to my studio 5 years ago, I had a suspended double fluoro installed above my work table to make sure that the work space was well lit. But even with this central light, tasks lights were still needed at every station around the table. 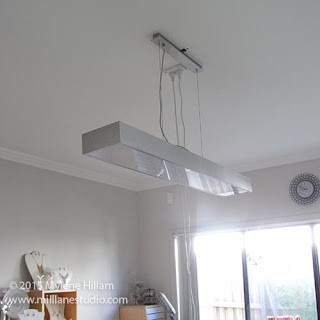 Having a suspended light seemed like a good idea at the time but with light only hitting the tables, the rest of the room was dark. And with so many cables and cords dangling from the ceiling, it looked untidy. But today, all that has changed. 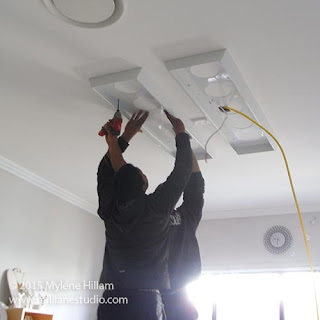 I had an electrician install two new ceiling lights which are flush mounted to the ceiling. I am quite impressed with how much light they give off and as I sit here at my computer, I am amazed that the light is reaching this far. You can see that I still have the power cords dangling from the ceiling (for power at the work tables) but it's much tidier now without the cables suspending the old lightfitting. But the best part of these new lights is that they are daylight LEDs and they give off the kind of light you get from a bright window. 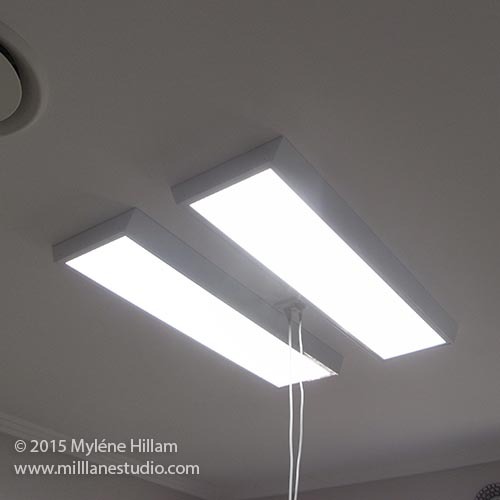 They will be extremely helpful when I'm photographing my work - I will no longer have to switch off the overhead lights to eliminate the blue cast thrown by the fluorescent lights which confuses the camera so much. 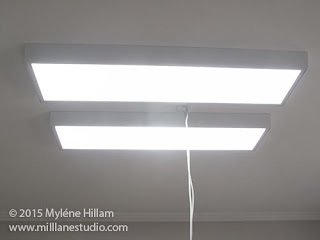 I won't be getting rid of my daylight task lamps any time soon because I'll still need those for close up work but I am grateful for the extra light I now have in the studio.